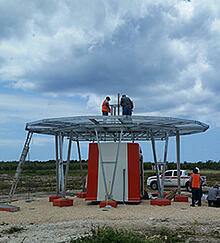 Leonardo Selex ES offers a variety of on-site field services from installation of equipment to post-warranty support. The refresher training can be accomplished without a NOTAM needing to be issued. Our certified technicians can provide tailored training to meet the customer’s needs and technical abilities for their staff. Level 1 support will be provided by the local technicians at the site provided by Customer. Level 1 maintenance is defined as routine scheduled maintenance, troubleshooting and clearing errors identified by the system and ground support for periodic flight checks. Should the technicians be unable to troubleshoot and fix the problem they would escalate to Level 2 support as described below. Should remote support procedures not resolve the problem than an on-site support visit can be requested, and a quote provided.